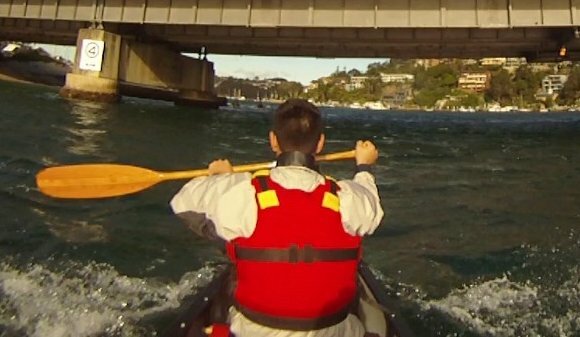 Canadian paddlers - I suspect a fraction tougher than Aussie paddlers! My alarm went at off 6am, rousing me from a brief but deep sleep. 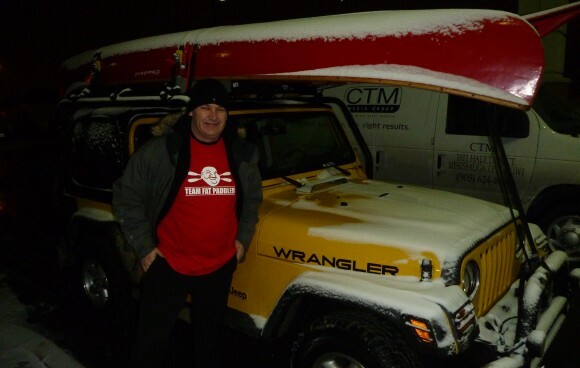 I was in a hotel room in Toronto Canada, it was around -10C outside and my head was foggy from a few too many rums with Canadian paddling friends the night before. 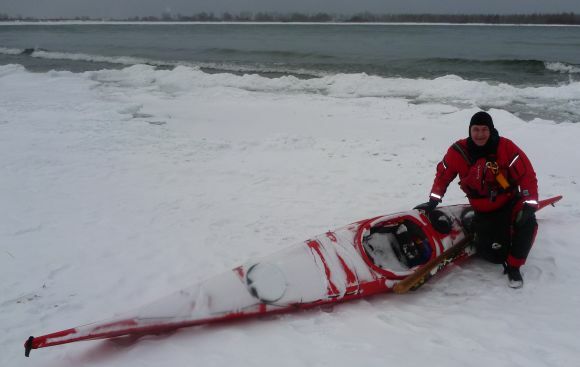 Not far away was paddle-mate Alan Drummond, on route to pick me up for an early morning paddle on Lake Ontario. When Alan arrived we took off for a quick breakfast of sausages and eggs with paddler Mike Ramsey of Badger Paddles, who also had with him a couple of custom canoe paddles I’d ordered a few months earlier. He was going to come with me on our little canoe trip so I could properly christen my new babies in the icy waters of Canada before taking them home. And like me, he too was shaking off the effects of a few quiet rums from the previous night. Juxtaposition, or denial? Either way, it helped me to feel a little warmer. Only a little! After a typical healthy Canadian breakfast (meat and potatoes baby!) we set off for the Complete Paddler to get changed into drysuits (thanks Costain!). Then the three of us took off convoy style for downtown Toronto, passing through the city as the sun slowly rose over the horizon. We pulled up to the snow-covered Cherry Beach, a supposedly “protected” area to access the choppy waters of Lake Ontario, where the water’s edge was iced up and the 1 foot breaking waves rolled in from the windy lake. The official temperature was -7C, but with a strong wind rushing in off the late, it seemed 20 degrees colder. Shivering and cold, I helped Alan unpack the boats ready for a paddle. Badger Paddles! Thanks Mike and Fiona, they're beautiful! Looking out over the lake, I was starting to feel nervous. 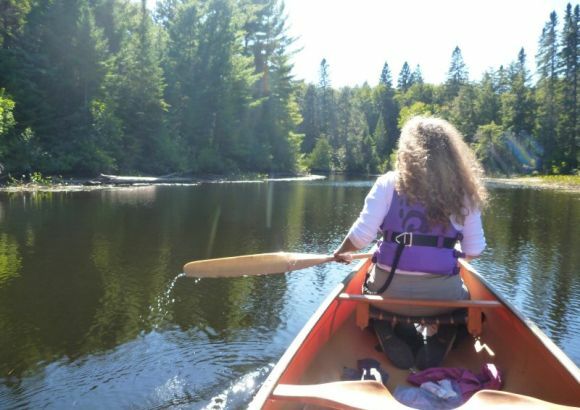 The water was icy, waves were breaking, and we had a pretty small and old canoe. With Mike and I both in it we’d be weighing it down with a good 550 lbs or more, considerably more weight that the little canoe was designed for. Plus the edge of the lake had formed ice sheets which we would have to carefully climb over just to get the canoe to the water. But I hadn’t come all this way for nothing, so we slowly edged the boat across the ice sheets and finally plonked the beautiful old boat down into the icy slush of the lake. Waves were still breaking against the boat and as it bobbed up and down, Mike and I both climbed in. The result was immediate. 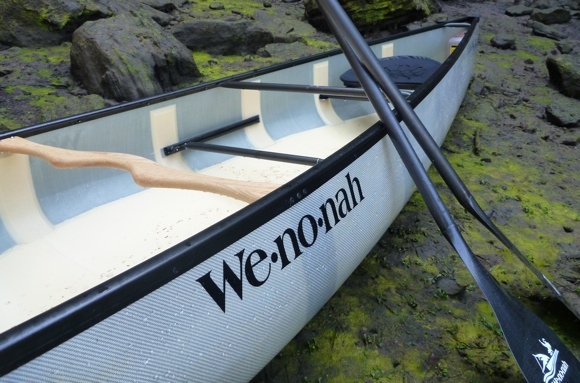 Our combined weight dropped the canoe low into the water, and as a wave broke against the boat, we buried a gunwale into the slush and icy water poured into the boat. As the next wave hit, yet more water poured into the boat. Within seconds, both Mike and I realised that we simply weren’t going to get the old canoe out through the waves without sinking her. It seemed like such a good idea at the time. 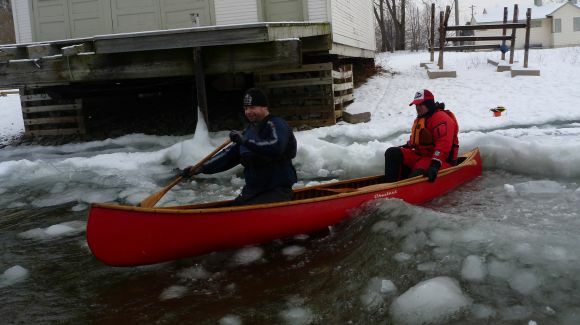 Ice, water, and two fat paddlers in a little boat! Ahh, Mike? I do believe we're SINKING!!!! And with that, I jumped over the side, dragged the boat back to the ice sheet and helped Mike get back on dryer land. 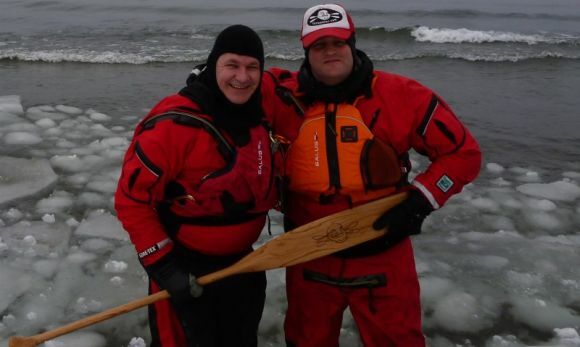 Then, safe in my drysuit, walked back out into the ice for a quick photo with Alan. Well, you cant say we didn't try. At least I got the paddles wet! 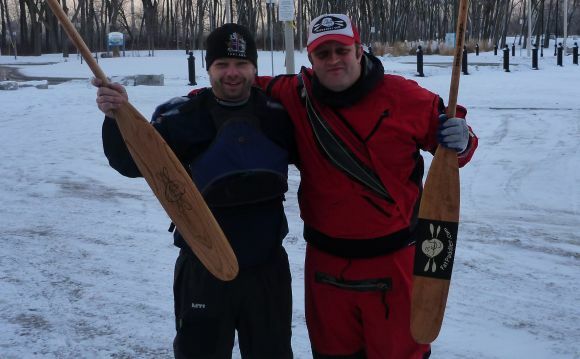 With that done, all that was left to do was to pack up, head back to the Complete Paddler to get changed, and continue onto the airport for a flight further north to Thunder Bay (coming soon). 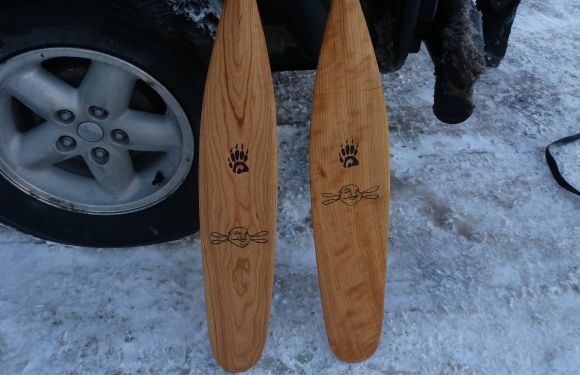 My new Badger Paddlers, tempered in the ice of Lake Ontario. 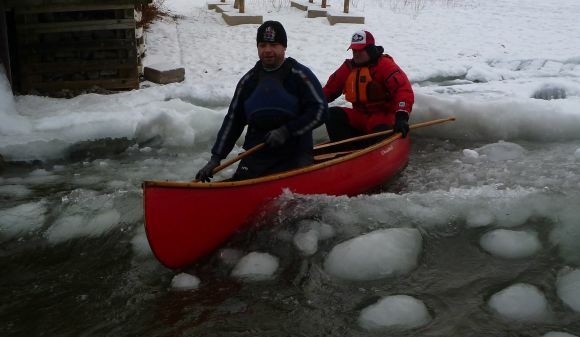 Like I said, that’s the best part of winter paddling. You just need to get the boat wet and instantly you have a great story to tell. Thanks so much for visiting Toronto! You my twitter friend are a lucky, lucky man. 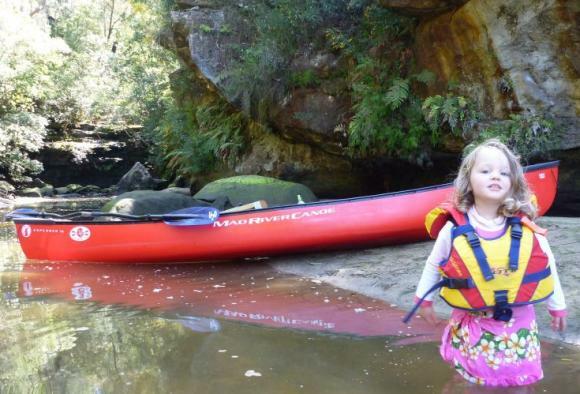 Paddling pals and adventures all over the globe. And some very sweet paddles. Looks as cold as it felt! Thanks for the visit. Next time we’ll get a bigger boat! 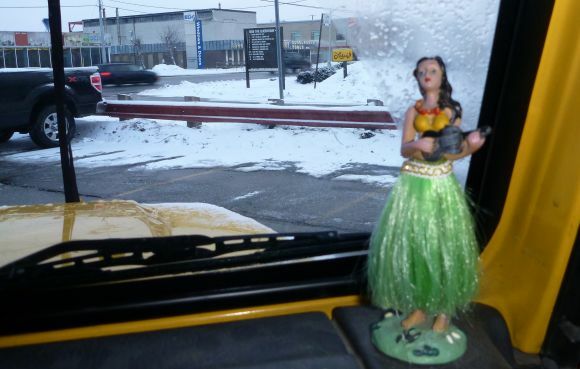 You should really come back when it’s warmer. We have some other really great scenery past all the snow drifts. Well you tried and there’s a lot to be said for that. They must’ve managed it in the pelt-trading days though. How, one wonders?